I jumped the gun and purchased some new additions to my beauty stash. I tend to buy more makeup in the fall/winter than at any other time of the year because 1) the weather’s conducive to wearing makeup since you won’t sweat it off; 2) my skin tone changes; and 3) the new releases are better this time of year (holiday collections and gift sets, anyone?). I had meant to save some of these purchases for my birthday, but fate worked its magic and I received a Bloomingdale’s rewards card and a space.nk ncentive (reward) in the mail at the same time. I don’t ever spend enough to continually receive rewards cards, so to have both happen at the same time was pretty amazing. If that wasn’t a fortuitous enough sign, Bloomingdale’s beauty sale (read: gifts with purchase) started a couple of days after said reward cards arrived (it’s still going on, if you’re interested). Now, I like to hoard reward cards all at once and buy something I wouldn’t have otherwise, so even with the sale coming up, I wanted to hold out and let the cards burn a hole in my pocket. I kept my resolve until I walked by the space.nk counters and saw their gift with purchase included the customary samples and a full sized blush from Kevyn Aucoin. 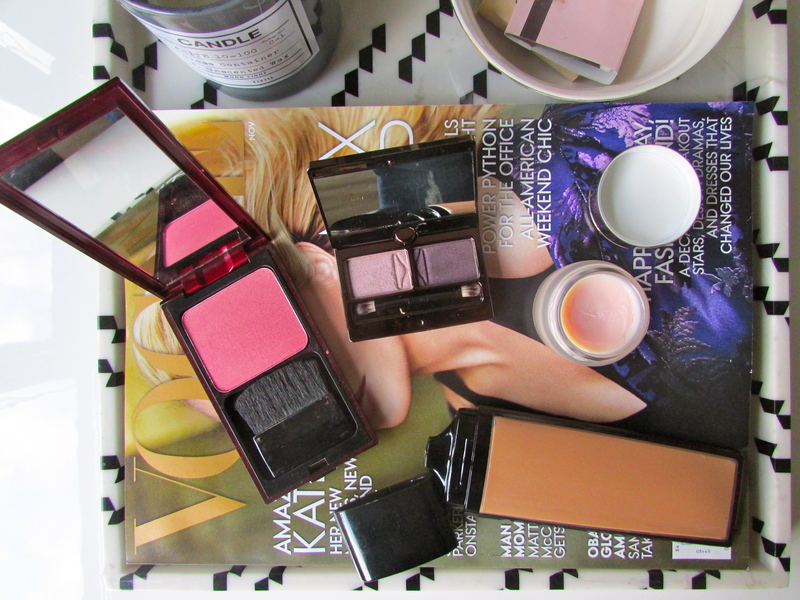 I was in the market for a blush, and the particular shade looked promising. So I sat down and had the makeup artist give me a makeover. I requested that he use the blush on promo so I could see if it worked with my skin tone. In addition, he also used the line’s light coverage foundation, and I picked out an eyeshadow duo from Hourglass to complete the look. The blush looked scary in the pan, but the deep berry shade applied beautifully to my medium dark skin, and with some light blending, didn’t look intense at all, just a lovely berry flush. In the end I walked away with mostly just the things I had already had on my list: a blush, a nighttime eyeshadow (the purple shades make such a great smoky eye), and a buildable winter foundation that offered a little more coverage than my tinted moisturizer. 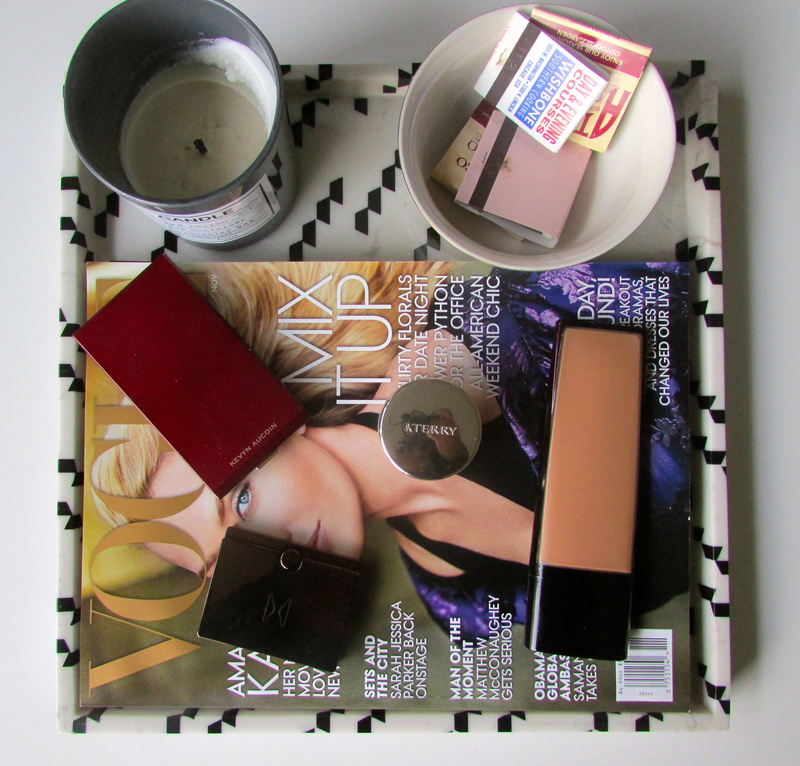 The foundation is also from Kevyn Aucoin, and it is the most amazing base. It feels like a tinted moisturizer but has the coverage of a foundation without the cakey-ness. The one addition to the list? The most ridiculously expensive lip balm ever. I still cringe a little every time I apply it to my lips, but I’ve eased the sting a little by reminding myself of the reward cards and the blush with purchase, which together really canceled it out. I know I’m rationalizing…The good thing is, it works really well, and I can feel my lips plump up with moisture every time I put it on. I slap some on at night and then I wake up with fuller, softer lips. Still, I don’t think this will be a repurchase without some substantial discounts of some kind.